King of Egypt from 247 to 222 B.C. ; referred to in Dan. xi. 7-9. According to that passage, the Egyptian king made great conquests in Syria, which statement is confirmed by external authorities. The idols of the conquered, together with gold and silver vessels, were, according to the Biblical passage, seized by him for Egypt; and the marble monument of Aduli supports this account in stating that Ptolemy III. brought back to Egypt 40,000 talents of silver and 2,500 statues of the gods, among them those which Cambyses had stolen from Egypt; this deed won for him the cognomen "Euergetes" (= "well-doer") in his land. Ptolemy III. was gracious toward the Jews. After his great victory he went to Jerusalem, sacrificed there according to Jewish custom, and made an offering of incense (Josephus, "Contra Ap." ii., § 5). 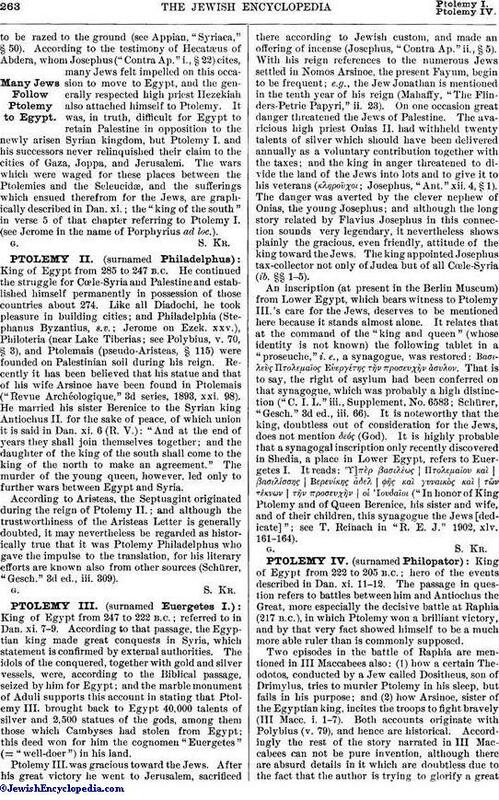 With his reign references to the numerous Jews settled in Nomos Arsinoe, the present Fayum, begin to be frequent; e.g., the Jew Jonathan is mentioned in the tenth year of his reign (Mahaffy, "The Flinders-Petrie Papyri," ii. 23). On one occasion great danger threatened the Jews of Palestine. The avaricious high priest Onias II. had withheld twenty talents of silver which should have been delivered annually as a voluntary contribution together with the taxes; and the king in anger threatened to divide the land of the Jews into lots and to give it to his veterans (κληροῡχοι; Josephus, "Ant."xii. 4, § 1). The danger was averted by the clever nephew of Onias, the young Josephus; and although the long story related by Flavius Josephus in this connection sounds very legendary, it nevertheless shows plainly the gracious, even friendly, attitude of the king toward the Jews. The king appointed Josephus tax-collector not only of Judea but of all Coœle-Syria (ib. §§ 1-5). An inscription (at present in the Berlin Museum) from Lower Egypt, which bears witness to Ptolemy III. 's care for the Jews, deserves to be mentioned here because it stands almost alone. It relates that at the command of the "king and queen" (whose identity is not known) the following tablet in a "proseuche," i. e., a synagogue, was restored: Βασιλεὺς Πτολεμαῖος Εὐεργέτης τῂν προσευχῂν ἂσυλον. That is to say, the right of asylum had been conferred on that synagogue, which was probably a high distinction ("C. I. L." iii., Supplement, No. 6583; Schürer, "Gesch." 3d ed., iii. 66). It is noteworthy that the king, doubtless out of consideration for the Jews, does not mention δεός (God). It is highly probable that a synagogal inscription only recently discovered in Shedia, a place in Lower Egypt, refers to Euergetes I. It reads: ϓ]πὲρ βασιλέως | Πτολεμαίου καὶ | βασιλίσσης | Βερενίκης ἀδελ | φῆς καὶ γυναικος καὶ | τῶν τέκνων | τῆν προσευχὴν | οἱ Ἰουδαῖοι ("In honor of King Ptolemy and of Queen Berenice, his sister and wife, and of their children, this synagogue the Jews [dedicate]"; see T. Reinach in "R. E. J." 1902, xlv. 161-164).